Star Wars: Republic Commando is a brilliant little piece of software. It is a first person shooter set in the Star Wars universe franchise. You play as “38,” also known as “Boss,” the leader of a four-man squad of clone trooper Commandos known as “Delta Squad.” The game takes place in the same time frame as the second and third Star Wars films, starting on the Battle of Geonosis – that big ending battle from the second film. After that, you are deployed to a decrepit Republic freighter that has been assaulted by mercenaries and Separatist droids. Finally, you do covert ops on the Wookie (Chewbacca!) homeworld of Kashyyyk, culminating in a climactic final battle with the Separatist forces. Remember that scene in the third movie with all the Wookies fighting the droids? Yeah, you’re there. This ends up punctuating the tension of the game into three arcs, first Geonosis, then the freighter, then Kahyyyk. However, this works beautifully. Consider a longer game with only one thread of tension running through it. Many games may take in excess of ten hours to beat. The tension decreases dramatically because your experience is so punctuated – you’re not playing fifteen hours in one sitting (I hope you aren’t at least). 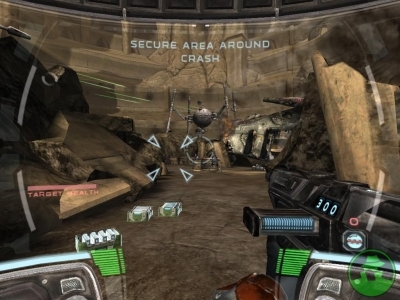 Republic Commando avoids this problem by breaking the game down into three “Acts,” each with a discrete rising action and brief denouement before the next. This game offers a really fresh take on the Star Wars franchise. The movies are very Jedi-centric, and because of that they have a certain tone. By this I mean the element of danger is less omnipresent. Not so in Republic Commando. You’re a soldier – albeit a highly trained one – and even droids can kill you if you aren’t careful. This tone – gritty and more personal – combines with the tension provided by the “Act” setup to form a much more compact, forceful Star Wars experience. 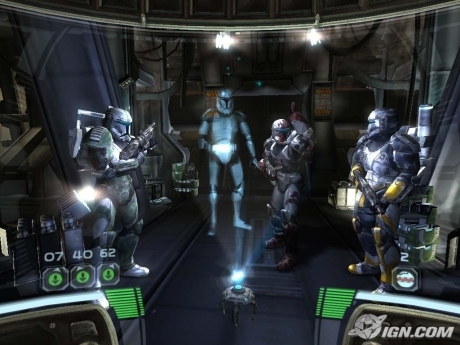 In Republic Commando, your squad is your lifeline. You can direct them in combat with presses of the “F” key and the F1 through F4 keys. Let’s say you’re in a firefight with some droids in a large courtyard. There is a piece of destroyed masonry crossing the center. Hovering near it is a translucent white target (more on this in a second). You orient yourself towards it and press “F.” The Boss says something like, “Take cover, Commando.” The appropriate squad member will dash to cover and begin firing from that position. The F1 through F4 keys handle functions such as regrouping and holding ground, offering you another degree of control over your squad mates. The translucent target comes from your “Heads-Up Display” in your clone trooper helmet, your health, ammunition, and vital environment information are relayed to you as electrical displays in the corners of your character’s visor – cleverly avoiding the problem of simply having this information displayed on the screen for no apparent reason. What makes a good character? I run through a useful exercise whenever I encounter this question. Describe the character without using any concrete physical terms – like appearance, race, or clothing. For the purposes of this exercise, let’s look at two Star Wars characters. Han Solo: Rogue with a heart of gold. His sense of morality develops throughout the movies as he grows closer to Leia – even though it’s clear from the get-go that he doesn’t consider himself just another criminal. Sarcastic and witty. Atheistic in the sense that he doesn’t believe all the “mumbo-jumbo” about the Force. Practical, pretty cool under pressure. Usually just gets frustrated during fights. Has a funny back and forth with Chewbacca. Queen Amidala (Padme): Luke and Leia’s mom. Queen of Naboo….uh…. See what good characterization does, and how easy it is to check for it? Here’s the kicker: all the members of Delta Squad wear identical armor, save for coloration differences and some equipment differences. You will never see a squad member’s face. But by the end of Act 1, you’ll know these guys better than your girlfriend. 07 “Sev”: The hunter. Brutally efficient. Favors the sniper rifle. Very dark sense of humor, for example: “A well-built sniper rifle is a beautiful thing. Ours has two zoom modes, “Up close and personal,” and “Hello, you’re dead.” (IMDB). Gets frustrated when injured in combat. Strong sense of loyalty to the squadron. He likes killing, no bones about it. 62 “Scorch”: Demolitions expert and explosives aficionado. Unflappable commitment to humor. Unlike Sev, favors witty comebacks to dark observational jokes. Seems to view being a soldier as more of a job than anything else. Enjoys something of a repartee with Sev (Scorch: Was it red-red-green or red-green-red? / Sev: And he’s supposed to be the demolitions expert? (IMDB)). Strong sense of irony, does not relish combat in the same sense that Sev does. Jokes freely with figures of authority. 40 “Fixer”: Skilled mechanic and hacker. By the books, all business. Hardly ever cracks jokes and never uses nicknames to refer to squad mates. Loyal to his squad but seemingly neutral on all matters of opinion. Does he like fighting? Does he agree with the war? Who knows. In this regard, he has less humanity than Sev, who you’ll grow to like once you get used to his sense of humor. This doesn’t make “Fixer” more sinister, but only more detached and aloof. For a long portion of the second Act, you are separated from the squad. You’re completely on your own and the sense of vulnerability really kicks in. By the time you regroup, you’ll have never been happier. This is what makes Republic Commando great. It actually makes you attached to a squad of three fictional soldiers without faces! So what are we left with? A taut, well designed shooter with an emphasis on fighting as a team, a well structured sense of tension and plot, a gritty soundtrack and aesthetic, and a group of characters that you actually care about, who you hope to god will make it through this war alive – as only this medium can do. Republic Commando is a videogame’s videogame. Pick it up if you ever have the chance, you won’t be disappointed.